The Philae temple complex is one of Egypt’s most fascinating ancient sights. It was originally located on Philae Island, a sacred place with connections to the cult of Isis that date back thousands of years. The current temple complex was started by 30th-dynasty pharaoh Nectanebo I and added to by the rulers of the Greek, Roman and Byzantine periods that followed. In the early 20th century the complex was partially flooded after the construction of the Aswan Low Dam. Later, plans for a second dam caused UNESCO to launch a salvation project which relocated the temples to higher ground on neighboring Agilkia Island. Today, the complex continues to impress tourists in the same way that it has for centuries. Once located in a cataract of the River Nile, Philae Island was believed to be one of the burial places of the Ancient Egyptian god Osiris. It was considered sacred to his wife, Isis, by the Egyptians and their Nubian neighbors and archaeologists have found evidence that temples honoring Isis existed on the island from at least the 6th century BC. Today, the oldest surviving structure, the Temple of Isis, dates back to the time of Nectanebo I who ruled from approximately 380-362 BC. He was the founder of the last native dynasty of Egyptian pharaohs. The temple complex was added to by Ptolemaic and Roman rulers up until the 3rd century AD and was a place of pilgrimage for followers of the cult of Isis long after Christianity arrived in Egypt. In fact, the temples were only closed or repurposed for Christian use in the 6th century AD, making the Philae temple complex one of the country’s last places of pagan worship. In the Victorian era, Philae was one of the most popular destinations for European tourists with a passion for Egyptology and continues to be a highlight of Nile cruises today. In 1902 the construction of the Aswan Low Dam caused Philae Island and its temple complex to flood for most of the year. Tourists could explore the partially submerged ruins by rowboat and the temple foundations were strengthened to help them withstand the annual flood damage. However, the bricks became encrusted with river silt and the colors of the temple’s fabulous reliefs were washed away. When plans for the Aswan High Dam were revealed in 1954, it became clear that Philae Island would soon be fully submerged — and its ancient treasures lost forever. As a result, UNESCO launched their International Campaign to Save the Monuments of Nubia in 1960. The project excavated and recorded hundreds of sites and recovered thousands of artifacts that would soon disappear beneath the water. It also made plans to relocate several of the region’s more important temples – including Abu Simbel (located on the shores of Lake Nasser) and the Philae temple complex. At Philae, a coffer dam was built to keep the river water at bay while the monuments were cleaned, measured and dismantled. The temple and its accompanying shrines and sanctuaries were moved brick-by-brick to nearby Agilkia Island and painstakingly reconstructed on higher ground. 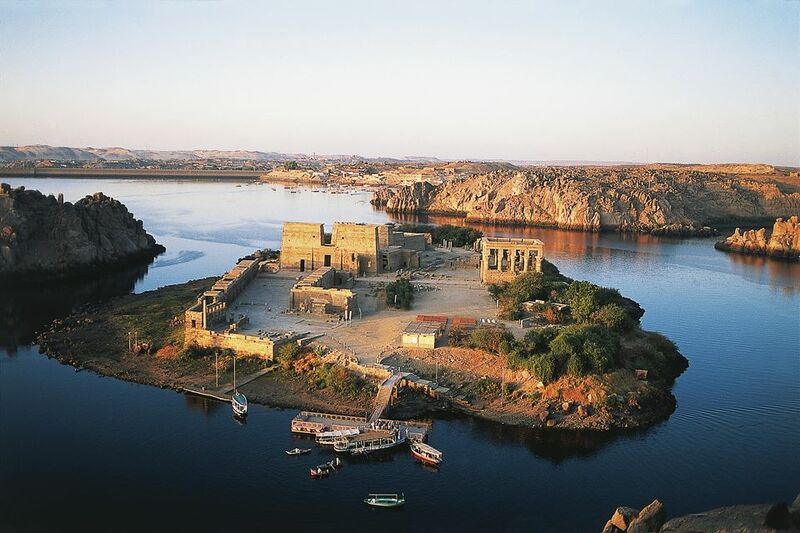 In the name of authenticity, Agilkia was even landscaped to match the temple’s original setting on Philae Island. Modern tourists arrive by boat and start their tour at the oldest part of the Temple of Isis, the Kiosk of Nectanebo. The entrance to the main temple is guarded by the First Pylon, an 18-meter-high monumental gateway decorated with incredible reliefs. These reliefs are attributed to various different pharaohs and Ptolemaic kings and include a famous depiction of Ptolemy XII Neos Dionysos dispatching a band of enemies. Isis, Horus of Edfu, Hathor and various other members of the Egyptian pantheon also appear. After passing through the First Pylon, visitors find themselves in the temple forecourt. Colonnades on either side provide entry to various rooms including the Birth House. This intriguing building was dedicated to Isis in honor of the birth of her son, Horus, and contains reliefs depicting scenes from the falcon-headed god’s childhood. In the past, pharaohs performed rituals here to celebrate the Isis legend (which included their own descent from Horus, thereby legitimizing their divine right to rule). A Second Pylon leads into the vestibule of the inner temple. It features eight magnificent columns while Coptic crosses carved into the walls show how the temple was transformed into a place of Christian worship during the Byzantine era. Beyond the vestibule lies the sanctuary, where granite shrines once held a gold statue of Isis and the barque in which it traveled. These have since been removed to museums in Paris and Florence. Although the Temple of Isis is the complex’s main attraction, there are a series of other worthwhile monuments. These include the Temple of Hathor, which was built by Ptolemaic kings Philometor and Euergetes II and later added to by the Emperor Augustus. The Gateway of Hadrian features reliefs commissioned by Roman emperors Hadrian, Marcus Aurelius and Lucius Verus; while the unfinished yet undeniably beautiful Trajan’s Kiosk was a favorite subject of Victorian painters. Christian ruins include the remains of a monastery and two Coptic churches. There are several ways to visit the Philae temple complex. Agilkia Island features on the itinerary of most of the cruises that ply the river between Luxor and Aswan. Alternatively, many operators offer day tours from Aswan that take tourists to the Philae temple complex as well as nearby attractions like the Unfinished Obelisk and the Aswan High Dam. It’s also possible to arrange a visit independently. Simply take a taxi from Aswan to the Marina Philae Temple, where official boats wait to transport visitors to Agilkia Island. One of the most popular ways to visit the complex is via the Philae Sound and Light Show. This after-dark spectacle uses colored lights, laser projections and audio commentary to resurrect the pharaohs of old and bring the legend of Isis, Osiris and Horus dramatically to life. Presentations are available in several languages including English, French, German and Spanish. Tour operators offer package deals to the Sound and Light Show that include entrance fees, river transport, a guide and hotel pick-up and drop-off. Regular visiting hours are from 7 a.m. to 4 p.m. (October to May) or from 7 a.m. to 5 p.m. (June to September). Admission costs 50 EGP (approximately $3) for adults and 25 EGP for students. If your haggling skills are up to scratch you can expect to pay around 10 EGP for a return boat ride from the mainland to Agilkia Island — although boatmen will typically try to charge more. Tickets to the Sound and Light Show cost $14 per person.